Angry bikers and undead zombies wreak havok on a zealous religious cult high in the Ozarks. When the investigation on a prostitute murder by the Paris vice department derails, one cop will stop at nothing for revenge. Hillary and Bonnie meet one morning by the side of the road. They become fast friends, share their secrets, and on a rising wave of frenzy later that afternoon, murder an old woman. They did it, they say later, for fun. Two childhood friends dream about escaping to Los Angeles to pursue their fame and fortune. Jeffrey: people have given their lives to perform the work of the Lord! Zombie Cult Massacre is an interesting zombie flick but its not all that good. Zombie Cult Massacre is about a couple who is on a car trip but gets into an accident with a zombie which gets them mixed up with a religious cult. Outside of the cult there are zombies roaming about. Later a gang of bikers get involved with the cult and the zombies.Marvin (the new cult member)and the leader of the cult get into a feud which becomes a battle for power. Its like someone put a biker movie, a zombie movie and a movie about a cult in a blender and pressed mix. The movie does contain a high gore content. 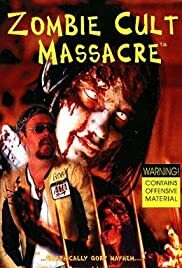 I like the general story of Zombie cult Massacre but gets to involved with religion and the cult that it takes away from the zombies which is the original plot.I wouldn't call Zombie Cult massacre a terrible movie just really disappointing. It could have been better.